Birds with gout often require lifelong management. The uric acid disorder gout is growing among humans in the West, and it in pet birds, as well. Parakeets are particularly susceptible to the ailment, despite being overall robust, sturdy creatures. If your parakeet has gout, prompt veterinary assistance is a must. Gout is caused by inordinate uric acid in the bloodstream that leads to the accumulation of uric acid deposits in organs and joints. Gout exists in two forms, one that arises due to problems with protein deconstruction and one that arises due to the kidneys having difficulties in sufficiently getting rid of the uric acid. If you are worried that your parakeet might have gout, get him to an avian veterinarian, pronto. Some telltale symptoms of this disease in birds include exhaustion, reduced appetite, increased water consumption, shifts in general disposition, weight loss and unusual appearance of the stool matter. Birds with gout often have lots of urine accompanying the stools they pass, which is referred to as polyuria. 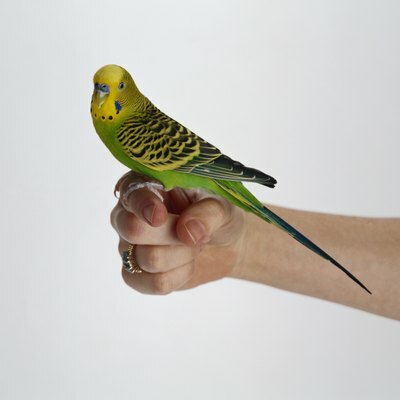 Your parakeet might also experience swollen limbs and aching, tense joints, and he might even walk in a conspicuous dragging style. Some birds with gout pass away suddenly. If the veterinarian establishes that your parakeet has gout, she can determine exactly how to proceed in managing it. Figuring out the cause is imperative to managing the condition, whether the root trigger is genetic or related to kidney disease or anything else. Dietary issues can lead to gout, such as excessive protein intake and frequent dehydration. If either of those things are the case with your bird, the veterinarian might suggest key dietary changes. A variety of other things are thought to bring upon gout, including inadequate physical exercise. Management of gout typically involves handling causal factors. Other common management options for gout include fluid therapy and medicine that reduces uric acid. If your parakeet has gout, only a veterinarian can decide what he needs to start feeling better. Gout isn't the only condition to which parakeets are particularly vulnerable. Other medical issues that frequently affect these birdies are lipomas, excessive weight gain, increased size of the thyroid gland and the skin condition known as scaly face mites. Keep the possibility of these conditions -- and gout -- in mind by regularly taking your parakeet in for veterinary appointments, even when he doesn't seem to be exhibiting any symptoms of a health problem.